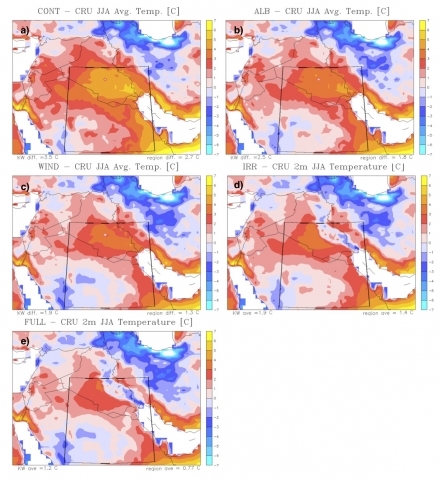 A warm surface air temperature bias of 3.5C is simulated in the summer by using the standard configuration of Regional Climate Model version 3 (RegCM3). Biases are also simulated in surface albedo (underestimation), shortwave incident radiation (overestimation), and vapor pressure (underestimation). Based on satellite measurements documented in NASA’s surface radiation budget (SRB) dataset, a correction in surface albedo by 4% is introduced in RegCM3 to match the observed SRB data. Increasing albedo values results in a nearly 1C cooling over the region. In addition, by in- corporating RegCM3’s dust module and including subgrid variability for surface wind, shortwave incident radiation bias originally of about 45 W m/^2 is reduced by 30 W/m^2. As a result, the reduction of shortwave incident radiation cools the surface by 0.7C. Finally, including a representation for the irrigation and marshlands of Mesopotamia produces surface relative humidity values closer to observations, thus elimi- nating a nearly 5-mb vapor pressure dry bias over some of the region. Consequently, the representation of irrigation and marshlands results in cooling of nearly 1C in areas downwind of the actual land-cover change. Along with identified biases in observational datasets, these combined processes explain the 3.5C warm bias in RegCM3 simulations. Therefore, it is found that accurate representations of surface albedo, dust emissions, and irrigation are important in correctly modeling summertime climates of semiarid regions. Given a model that can more accurately simulate the current climate over this region, climate sensitivity studies can now be performed. For example, work should be com pleted in examining the effects of dust emissions and irrigation on the interannual variability and extremes of temperatures and humidity across the region. Similarly, future studies in discerning the effects of human impact (e.g., irrigation) on the regional climate can be achieved. 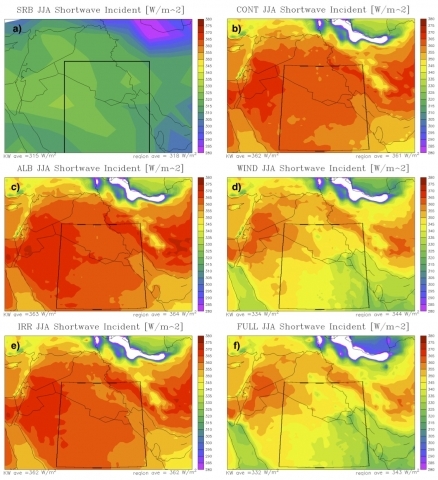 In any case, most importantly, this study uncovers the critical role that certain land surface processes common in semiarid regions have in determining the summertime climate of these regions.